Architecture for Humanity must be after our hearts! 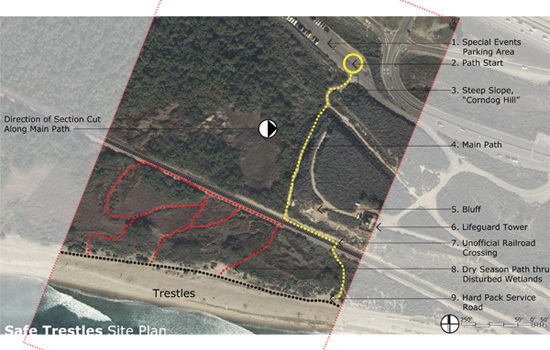 In response, a coalition of concerned groups organized by the volunteer non-profit organization Architecture for Humanity, are launching Safe Trestles, an open-to-all, two-stage design competition to create a safe pathway to serve surfers, the local coastal community and day visitors to San Onofre State Beach. This coalition is looking for cohesive designs that eliminate the danger of crossing active train tracks, help to restore wetlands that have been damaged by the present path, preserve and improve vistas, and offer education about the history of the site and the beach marsh environment. The new path should ensure continued access to the resources by all members of our community and adhere to Americans with Disabilities Act (ADA) standards. The deadline for registration and submission is April 17, 2010. Once you've fully reviewed the project brief and guidelines, check out the comment section where there is an interesting discussion about the need for such a competition. One commenter appears to be arguing that since a self-perceived element of hazard is an important part of the landscape's character, a designed access path “will just take the adventure away and whole surfing experience.” The landscape is sublime, and making it “safer” would betray this supposedly inherent nature. Setting aside the question of just how one goes about determining the “true” nature of landscapes (there's no such thing, if you were wondering), is there a design solution that will give you the best of both worlds: sublimity and ADA approval? Where is that balance? Does one even have to strive for balance, aiming instead for a strategy that's unequal parts feral wilderness and bureaucratic restrictions? Perhaps we're bringing our own baggage to the discussion but territoriality seems to be bubbling just below the surface of the comments critical of the competition. Reading between the lines, we suspect that inaccessibility is being seen as a filter separating those who don't mind and indeed can navigate the dangers of passing trains (e.g., surfers) from the public at large. The former have proprietary use over this beach while the latter are interlopers. A safer route would presumably bring the wrong kinds of users, the “rude people” (non-surfers?) who “go off the paths” and “will bring trash.” If you're on a wheelchair or intimidated by informal trails or a non-surfer, this landscape just isn't for you. But should it remain “closed” to you? Should (and could) this space be made a bit more egalitarian? In any case, we're very excited about this competition, and can't wait to see all the submissions, not just the finalists. The idea of access can be a complex discussion. Like the talks of providing ADA access to the Grand Canyon. Does the omission of the treachery of the experience remove the experience? 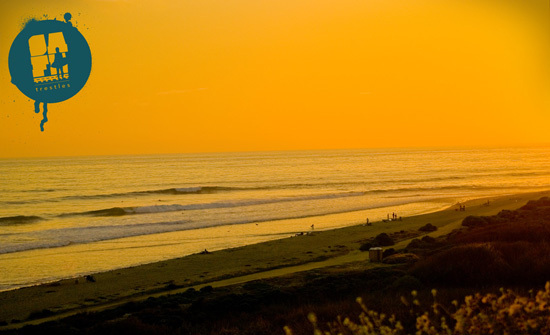 I've surfed near Trestles, and I have friends that frequent it. Access equals people and people equals crowds. The enemy of any local break. You'd be better off spending your time where it will be more appreciated. I assure you the surfers at Trestles want no such attention. This is why people have been beaten up while installing cameras on the beach for availability of surf checks online. The locals want nothing that makes access easier or more convenient in any way. And I have to ask, is anyone really dumb enough to think it's dangerous crossing a 3 foot live train track? Really?